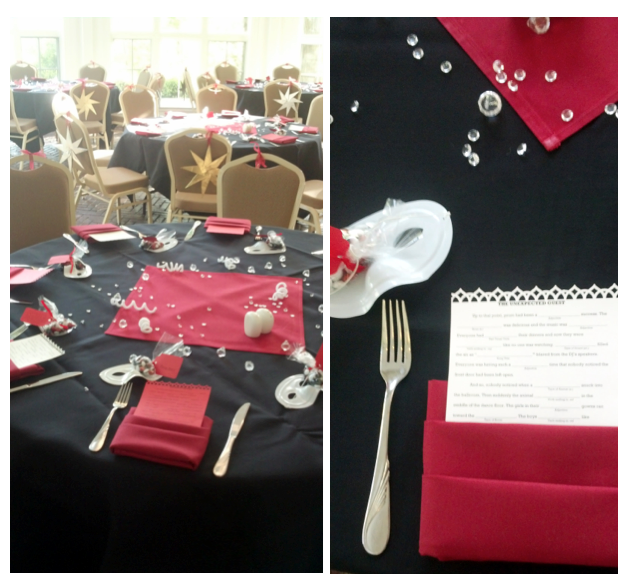 The theme for our Prom this year is Masquerade! So, as is the now-annual tradition, I have the privilege of planning/coordinating the aesthetic details, in all their (hopefully creative) glory! After last year’s fishy-centerpieces and Enchantment under the Sea theme, I was pretty excited at the potential for timeless elegance as a decorative choice this year! 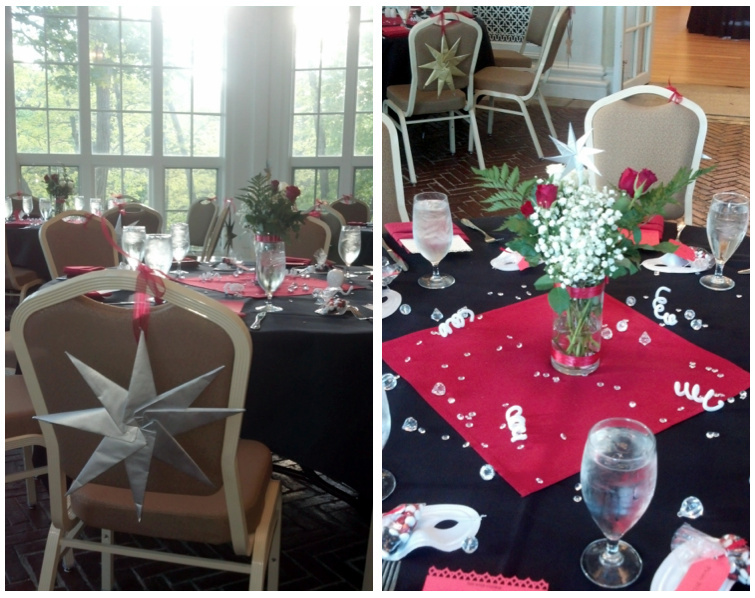 The ladies of the student council set the colors as black, white, and red, with accents of gold and silver. 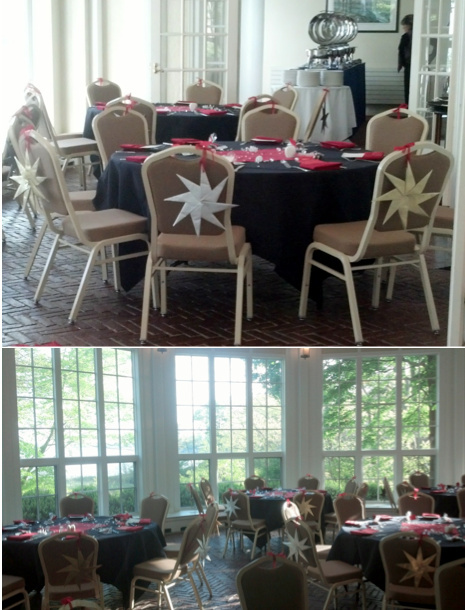 With those in mind, we tackled the details, and This year, we have quite the rundown as far as decor is concerned! I would walk you through the rest of it, but the tutorials from earlier really are better. 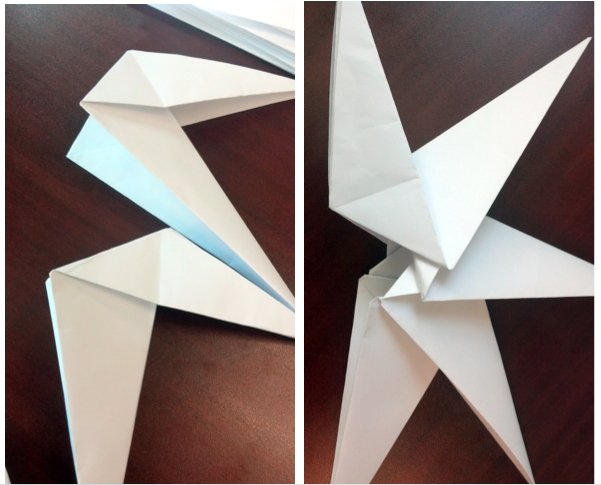 When you have 8 of the finished pieces, you slide them together until there are 8 connected pieces! After we finished making 70 different stars, we decided to use gold and silver spray paint to make these little beauties really shine. Once we were done, the finished product is quite lovely! 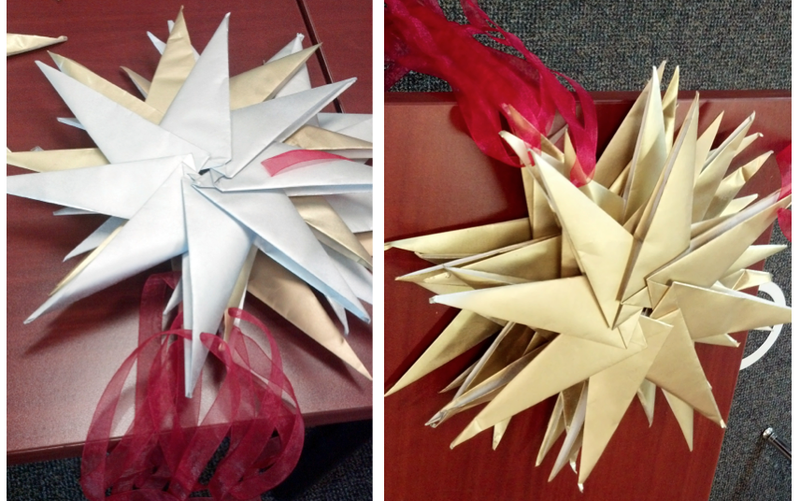 With a little hole-punching and some fancy ribbon, these were ready for action! 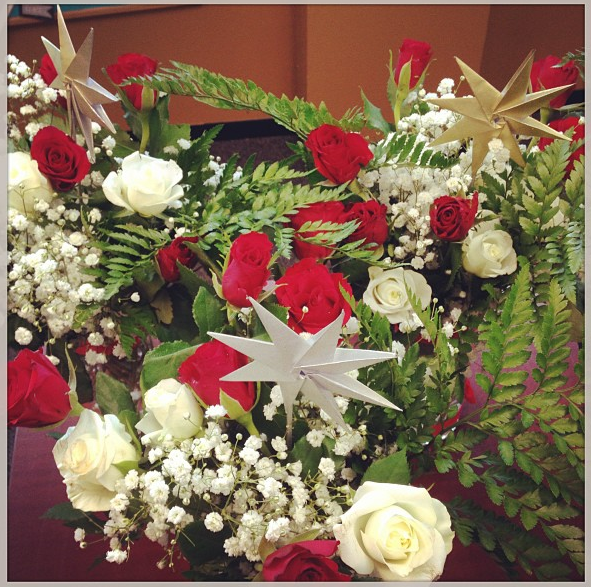 They wound up looking pretty magical when we tied them to the back of the chairs – alternating gold and silver!! With a dozen cheap cylindrical dollar store vases on my hands (a combination of those from dances past and a few present-day purchased to match), I thought we might be relegated to less-than-perfection as far as centerpieces go. . . until I remembered a random spool of red ribbon I had picked up after Christmas in some sale bin. Not perfect, but an improvement nonetheless. 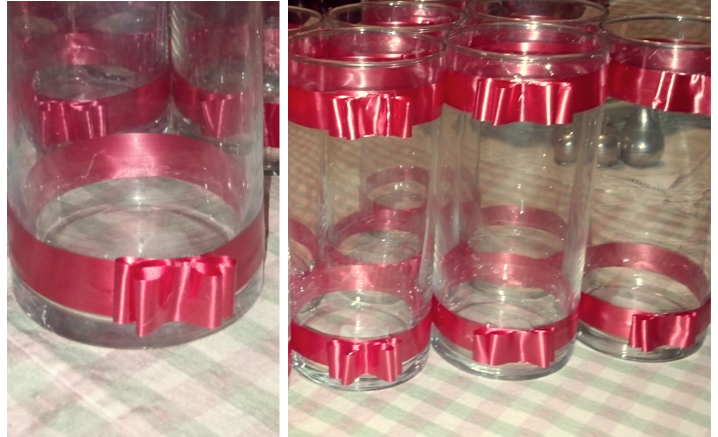 Fill these up with roses and baby’s breath and you are good to go! Well, baby’s breath and another little starry detail . . . 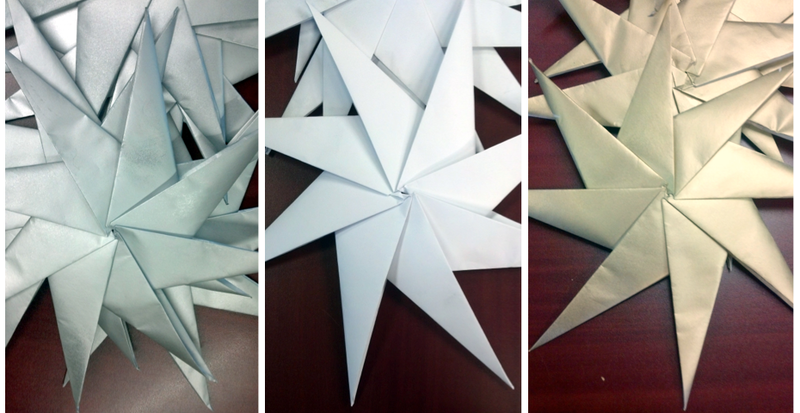 I made up some gold and silver mini-stars in the same style as the big stars (only with about 2 inch square paper to start with). 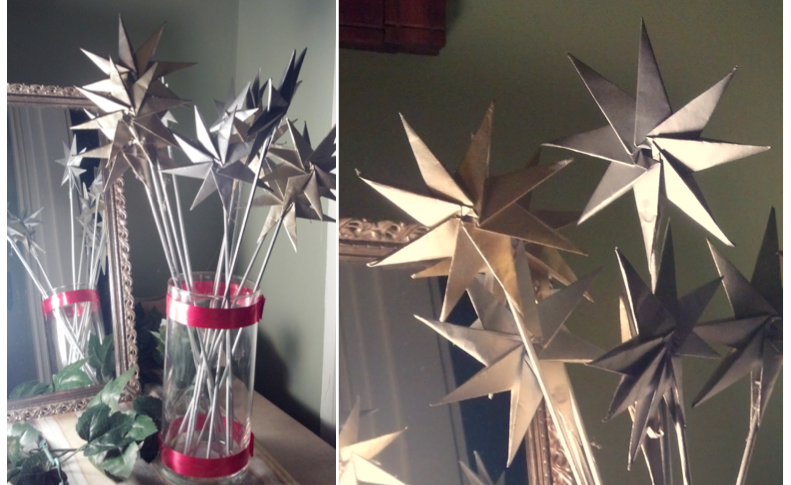 When they were done I hot-glued them to some slim little dowels to make the bouquet accents. The final effect was quite lovely, if I do say so myself! We finished off the tabletops with some scattered little “diamonds” and a couple of twirled white pipe-cleaners! We always try to keep some necessities available in the bathroom, for those just-in-case moments when students wish they had planned ahead! 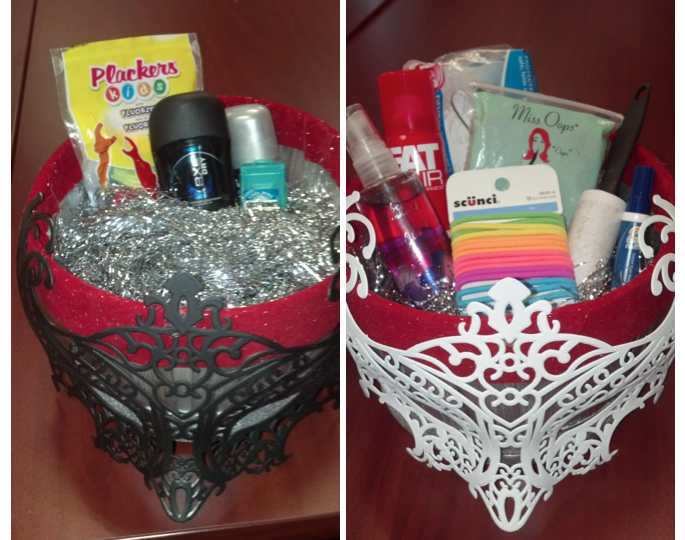 I happened to have a couple of baskets around, and so I decided to jazz ’em up for the masquerade theme. Good things to put in here include: tide sticks, wet wipes, band-aids, lotion, hand sanitizer, bobbie pins, safety pins, fresh shoe-laces (for mens dress shoes), deodorant, mints/gum, hair ties, lint rollers, hairspray, nail clippers, dental floss, and sometimes even duct tape! We even put socks (animal print, because disguises are du jour in a masquerade) in the girls restroom for when they ditch their heels on the dance floor. Detail #5: Mad-libs and Favors! Four original mad-libs (thanks to my friend Andrew’s mad-lib writing expertise), edged with an intricate paper cutter (thanks Martha Stewart) got tucked into the napkin folds, and then our favors included a mask for everyone, as well as a little bag of red, black, and white m&ms. As cute as the favors themselves were, I think what one of our students wrote for the tag was one of my favorite aspects of the evening – what a take-home message!